Las Vegas, NV (January 6, 2010) - Samsung Electronics America, Inc., a market leader and award-winning innovator in consumer electronics, today unveiled the CL80 and TL240, a pair of stylish, 14.2 mega-pixel digital cameras that are fully loaded with an array of impressive features that truly enhance the digital imaging experience for consumers. Highlighted by ergonomic and elegant designs, the new Samsung CL80 and TL240 are ideal for the consumer on-the-go looking for a camera that can do it all. The CL80 adds even more great functionality with the integration of Wi-Fi* connectivity and a 3.7-inch WVGA AMOLED touch screen, while the TL240 features an impressive 3.5-inch touch screen. Also, the CL80 has received a 2010 CES Innovation Award. The CL80 and TL240 will be on display during the 2010 International Consumer Electronics Show, January 7-10, 2010, in the Samsung booth #11026 in the Central Hall of the Las Vegas Convention Center. "Consumers are looking for that great all-in-one camera - a digital camera that takes great pictures, is visually appealing, and provides a wealth of features to ensure a great image or video every time," said Mr. SJ Park, CEO of Samsung Digital Imaging Company. "The CL80 and TL240 deliver on that need for consumers to have a camera that does it all, and in the case of the CL80 we've taken it even a step further by providing several connectivity options to share those photos and videos on the go." Samsung's design engineers were able to produce one of the most remarkable camera designs in the industry with the help of hydro-forming technology for the CL80 and TL240. Hydro-forming allows for greater flexibility during the design process and gives manufacturers the ability to produce smoother silhouettes, seamless bonding, and higher quality surfaces. The CL80 and the TL240 are the first consumer electronic products ever to be manufactured using hydro-forming technology. Despite their svelte 0.77-inch stainless-steel frames, the CL80 and the TL240 house impressive Schneider KREUZNACH lenses which boast a design inspired by the mirror-writings of Leonardo da Vinci. When powered up, the cameras' lens barrels extend and the lens specifications, including focal length and speed, appear with a hidden color accent in the concave reflective ring that surrounds each lens. These specifications are inscribed in reverse on the cameras' lens barrels and disappear when the lens naturally retracts into the camera body. The distinctive design makes an immediate and lasting impression. 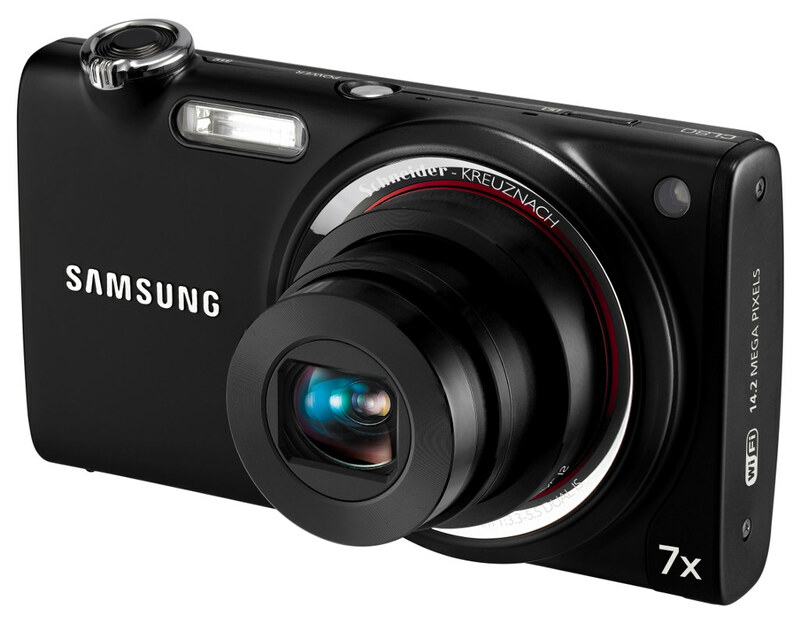 The Samsung CL80 and TL240 are also highlighted by a slanted design, which places the back of the camera at a seven degree angle. This subtle design accent proves to be extremely useful for consumers who are interested in taking self-portraits and group shots. The issue that many consumers face when taking self-portraits or group shots with traditional digital cameras is that the camera must be positioned much higher than the subjects in order to capture the complete image. Thanks to the seven degree angling of the CL80 and TL240, the lenses will always be pointed at the subjects' faces even if the camera is positioned at a lower angle. Furthermore, unlike traditional shutter buttons which sit flat on top of the camera, the CL80 and TL240 offer slanted shutter buttons which make the cameras more comfortable to hold and operate. The CL80 allows consumers to share their video and photos on the go without being tethered to their laptops or home PCs thanks to its wireless connectivity options, which include Bluetooth 2.0, Wi-Fi and DLNA. Using an available Wi-Fi connection, users can send a digital image to any email address using the camera's touch screen QWERTY keypad or selecting those stored the camera's address book. Users can also utilize the QWERTY keypad to include text within the body of the email. The CL80's Wi Fi connection also allows users to upload their images directly to popular websites such as Facebook®, Picasa™ and YouTube®, as well as SamsungImaging.com. The CL80 also includes Samsung's AllShare feature, which allows consumers to share content, including photos and videos, with other DLNA certified devices such as HDTVs and digital photo frames. This gives the CL80 user a seamless way to wirelessly transfer 720p HD video in addition to digital still images. To maximize speed and efficiency, all images transferred through Wi-Fi will be reduced to a resolution of two mega-pixels. Bluetooth 2.0 connectivity is also included in the CL80, allowing users to share and transfer photos directly with Bluetooth 2.0 compatible mobile phones. When using Bluetooth 2.0, the CL80 will automatically resize the digital image to a resolution of 1024x768 (1MB). The Samsung CL80 incorporates an impressive 3.7-inch wide WVGA AMOLED screen, while the TL240 features a 3.5" touch screen TFT LCD. Both cameras' massive displays house Samsung's Smart Gesture touch screen user interface which is complimented by an internal Gravity sensor for added ease of use. Smart Gesture is one of the most advanced and accurate touch-screen user interfaces on the market, and it gives users the ability to access and use key features with either a simple tilt or a hand gesture. The Smart Gesture adds a level of fun to the way users interact with and enjoy their content, allowing them to quickly scroll through their photos with a swipe of their finger or by slightly tilting the camera in either direction. Users can also easily delete photos from their library using Smart Gesture by marking an "X" on the screen with their finger, or rotate an image by drawing a circle (O) on the screen. Smart Gesture UI also offers useful auto-focusing options such as object tracking and one-touch auto focusing. Object tracking enables users to focus on any area by touching the location on the screen with their fingertip. Once the object or location is selected, the cameras will lock and keep their focus on the subject even if it's moving within the frame. Users can also proceed to take that photo by continuing to hold the location with their finger for two seconds, thanks to the cameras' one-touch auto focusing capabilities. The CL80 and the TL240 offer powerful 7x optical zooms on the high-performance, oversized Schneider KREUZNACH lenses. To help reduce blur, these impressive lenses are paired with Samsung's Dual Image Stabilization technology, which combines both optical and digital stabilizers to counteract the negative effects of a user's shaky hand. End-users can also take advantage of the cameras' 7x optical zooms and optical image stabilization while recording video. Both the CL80 and the TL240 offer 720p HD video recording at 30 frames-per-second in H.264 format. The cameras also come complete with built-in HDMI connectivity, giving users the ability to effortlessly view their HD video and digital still images on an HDTV or HD monitor. The new Samsung CL80 and TL240 also make it easier than ever for consumers to capture the perfect shot thanks to Samsung's Smart Auto 2.0 (Still & Movie) scene recognition technology. Smart Auto 2.0 technology will automatically recognize the user's current shooting environment and select the appropriate settings to achieve the best results possible. Additionally, Samsung's Smart Auto 2.0 scene recognition technology can also be used to record video, producing the highest quality footage and results no matter where consumers will be using the cameras. 4.1" x 2.3" x .77"
* Wi-Fi only available where verification not required. Samsung Electronics America's CES press releases, video content and product images are available at www.samsung.com/newsroom.